I love storytelling ... and who doesn't, right? It goes back to the caves and first camp fires - we sit together, we share stories and, by doing so, we lean in, we laugh, we fear, we relate and we learn. With this at it's core, "Sunshine Cinema" tackles climate change. 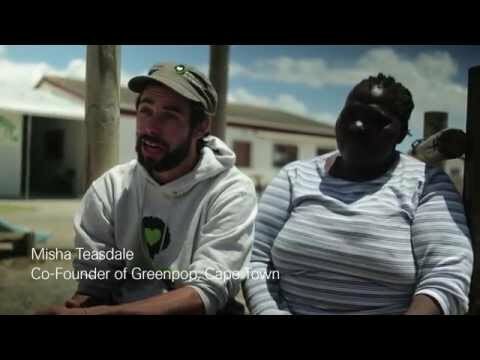 In this video clip Misha Teasdale, co-founder of Cape Town based social enterprise Greenpop, talks about an idea that came up after a Greenpop effort in Zambia in 2012 where they had planted just under 5'000 trees, built solar cookers with schools, set up micro nurseries and more. Listening to Misha, you get the sense of passion he has for these projects and so it comes as no surprise that he and his colleagues asked: "What more can we do? How can all of this make an even bigger difference?" The idea they came up with is beautiful in many ways. They decided to record the stories of individuals finding solutions to climate change issues. But they wouldn't just record those stories and put them on YouTube or some other website. No, the intent was to create a solar-powered cinema. A cinema, entirely powered by the sun, that would travel from village to village and share the stories of how things were tackled in other villages, other towns, other countries. This is, to Misha, essential: "The solutions need to come from within, not imposed by outsiders." The vision they have is even bigger. Besides recording and showing the stories, they will also map them. Those story maps would show concentrations of certain issues and their respective stories. Where the solar-powered cinema would carry the stories and solutions from village to village - the map would allow organizations to see the bigger picture to focus efforts. As I looked at this clip again, I did a quick search to see where they stand with the solar-powered cinema idea ... and what do you know - it's in the crowdfunding stage right now! I don't know if you will help to fund the "Sunshine Cinema" - but I know I will. Let's help them make this happen! Tags: #Open Minds video, #Video, #solar, #climate change, #sun, #cinema.